EBZ stands for European Centres for Culture and Communication ( In German: Europäische Bildungs- und BegegnungsZentren). EBZ consists of ten independent cultural and educational organisations in nine different countries. The primary aim of the EBZ is to encourage studies in European history, culture and politics. Literary projects, examination of conflicts, critical tourism studies, communicative development, integration, encouragement and advancement of potential artists etc. We work in co-operation with particular Irish and German partners such as Community Adult Education Centres and other (semi) state organizations. Focal point is the organisation of programmes and seminars: custom-made and corresponding to the special requirements of study groups from Adult Education Centres, Trade- Unions, Churches, Universities etc. Work (seminars, study stays) carried out primarily in Kerry, Donegal, the West, Northern Ireland and other regions. Objective is to meet the lrish people, get an insight into their every day life, their music and storytelling traditions etc. Study trips to sites of cultural and historical significance. Themed seminars: Ireland's literary traditions, politics, social and ecological matters etc. Study trips are also available for families and children. There are no set dates as such trips can take place all year round. Recommended length of stay in Ireland is 7-14 days. Since 1984 the European Centre fur Culture and Communication Ireland (In German: EBZ; represented by Gaeltacht Irland Reisen), has offered and organised educational / cultural visits, projects, seminars and workshops in the Irish Republic and in Northern Ireland, each of which complies with the respective special educational requirements of community adult education centres, trade unsions, churches and other institutions working in the educational / cultural field. 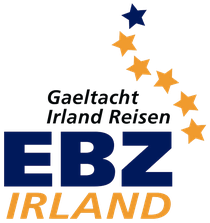 The EBZ Irland is part of and is a centre of a comprehensive European-German-Irish/Celtic network, which provides multifaceted contacts to persons and institutions from all parts of society. A new Europe is beginning to develop in which contacts between people and institutions are growing at all levels of society. Thousands of networks tie Europe's citizens more closely together. EBZ stands for European Centres for Culture and Communication. EBZ consists of seven independent cultural and educational organisations in nine different countries. The primary aim of the EBZ is to encourage studies in European history, culture and politics. This folder contains a presentation of EBZ's sevent centres. Together they offer a wide variety of exciting educational and cultural exchanges. They also function as contact links to the different cultural and educational institutions within their respective regions and countries.